A successful career, an ailing grandmother, a one-night stand, and a Southern family with untold secrets. Leia had always been close to her grandmother, but did she really know her grandmother? After finding out her grandmother has been suffering with dementia for over 10 years, Leia puts the job she loves on hold and goes to Alabama to see what actually is going on. What Leia finds at her grandmother's home isn't what she had expected, and coupled with her unexpected pregnancy was a bit ​overwhelmed. Grandmother Birchie and her life-long friend, Wittie, are delightful characters and characters that can no longer live alone, but are putting up a fight.​ When the secret in their attic is found, they get a reprieve from having to leave their home becaus​e the Sheriff ordered them to stay in the state. THE ALMOST SISTERS had a lot of drama​ and a lot of love​. I thoroughly enjoyed the storyline, the Southern charm, and especially the characters. They all were lovable, authentic, and sweet in their own way. 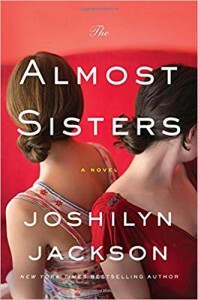 THE ALMOST SISTERS was a very enjoyable first book I have read by ​Ms. Jackson​. She has a marvelous writing style and a women’s-fiction-theme-based story with some characters having unusual problems and others with normal, everyday problems that the reader can relate to. THE ALMOST SISTERS is a touching, endearing book about family. I would ​recommend THE ALMOST SISTERS to readers who enjoy Southern living and adorable characters you wish you could spend some time with and will miss once you turn the last page. This book was given to me free of charge and without compensation by the publisher in return for a honest review.